During our trip to Scotland last year, we went to Helensburgh to visit Charles Rennie Mackintosh’s Hill House. Our entry was free as part of the reciprocal agreement with the National Trust and our Royal Oak Foundation membership. I highly recommend buying a Royal Oak membership if you are travelling from the US to the UK and plan to do some sightseeing. We decided to have lunch in Helensburgh before venturing up to the Mackintosh beauty of Hill House but had no idea what was in town. We walked down a single street, poking our noses up to a couple of restaurants, but nothing piqued my family’s interest. That is until I spied a small, brown awning across the street. The pastries in the window were more than enough to convince my daughter and I that we’d found our destination. However, after perusing the menu at the front, my son and husband also were sold. In recent years, many pubs, restaurants and tearooms across Scotland have been infiltrated by the American style menu: nachos, beefburgers (hamburgers), hot wings, etc. As a native Scot, it really ires me to fly over 5000 miles then go to a little cottage pub in the country, only to be greeted with American fare on the menu. My husband, son and I ordered the Scottish breakfast, and my daughter asked for the lentil soup and bread. When her soup arrived, she immediately looked at me with concern. It didn’t resemble “our” lentil soup, was what “the look” told me. I had forgotten to tell her that the soup would probably be made with red lentils, not brown or green. However, after her first spoonful, her face lit up! She loved the Scottish red lentil soup, and although looking a bit too “healthy” for her tastes, the country-style bread also received five stars on her taste bud test. My daughter still talks about the Scottish Red Lentil soup and bread. Craigard Tearoom’s soup didn’t have barley, but I love it, so sometimes I add it. 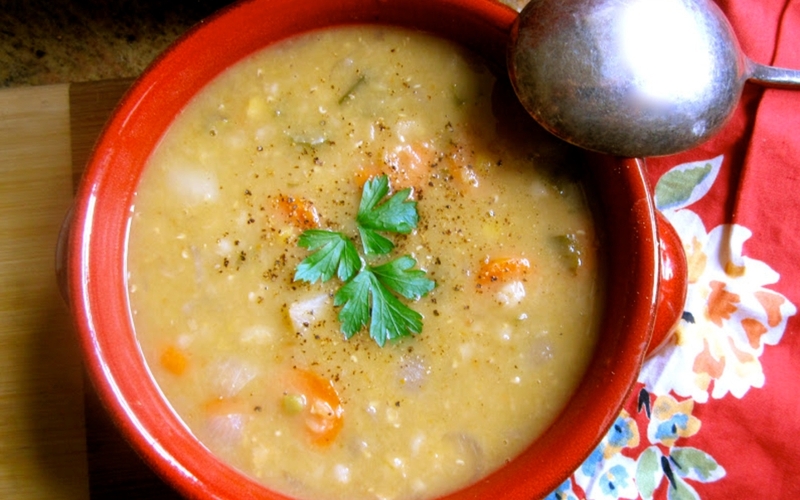 Additionally, if you want a gluten-free version of this soup, just omit the barley. You probably won’t be visiting the Craigard Tearoom anytime soon (unless you’re in Scotland), but you can make a delicious pot of this red lentil soup which is very similar to the one they serve. Since my daughter fell in love with the Scottish red lentil soup, I attempted to recreate it after scouring the internet for recipes (and not finding anything I liked) and from my memory of how the soup tasted. I think I’m pretty close and my daughter agrees, but she still says the tearoom’s was better. It’s too bad I can’t recreate a Scottish tearoom atmosphere in my house. Scottish Red Lentil Soup (with or without barley) – view the full recipe here. Christina Conte is a Scottish Italian cook living in Los Angeles. She is usually cooking, baking or (cr)eating something scrumptious, when she isn’t in the kitchen, she loves to travel, especially to her homeland of Scotland. Christina is a World Porridge Champion and has been a judge at the World Scotch Pie Championships. She is constantly promoting Scottish food as some of the best cuisine the world has to offer—one steak pie and sticky toffee pudding at a time.